Our commitment to product innovation and quality is, and has always been, the focus of our business —providing you the best and most advanced products, while continuously working on the next exciting products and designs. MoSER sinks and faucets are exclusively available through select countertop fabricators across Canada and the United States. With the necessary experience, technical know-how and expertise, MoSER dealers expertly answer questions and ensure your selection matches your exact specification. 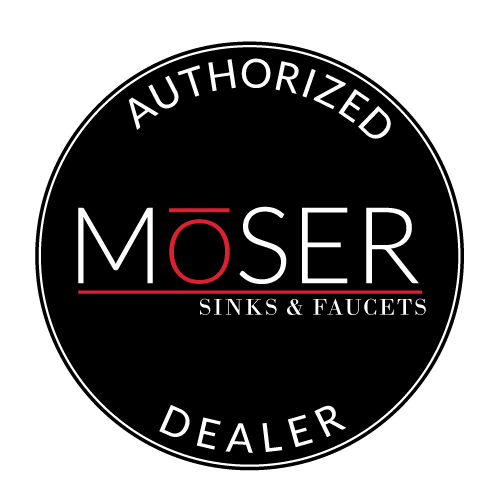 We recommend that you only purchase your MoSER sink or faucet along with any accessory from one of these fabricators, as these have met our high customer service and quality standards. To ensure that your countertop professional is authorized to sell MoSER products, look for the MoSER Authorized Dealer badge. Never buy from unauthorized resellers online. Beware of exceptionally low price offers on MoSER products. Always make sure you are buying from an Authorized Dealer by looking for the MoSER Authorized Dealer badge. When in doubt, please do not hesitate to contact us. © 2017 Moser. All rights reserved.